As we take notice of the 20th anniversary of the Archive, it might be fun to look back at how the site appeared in the early days. The basic look of the Archive's front page goes back to a terrific design that John Wooten put together in 2000. That put all of the links off to the side, with the central area being devoted to a sort of mission statement, a feature call-out graphic, and links to news and polls. Prior to that the looks featured on the front page were a combination of scroll-through lists and simple tables. In the very early days the front page utilized the infamous marble background, which remained in use on the entry pages for many years. You can get a sense of this evolution by referencing the WaybackMachine at this link. The referenced page is a commemoration of the Archive's millionth documented hit, which occurred in 2001. You can view a version of the front page that references the milestone here. Browsing WayBack's snapshots of the site during the year 2000 is especially interesting. This was one of the Archive's most active periods, and you can see the design and advertised features changing regularly. For a while the front page used animation. When you scrolled over various links, the image in the coin area would change to reflect the category. We got rid of that due to bandwidth concerns. We also got rid of the splash page. Anyone remember that? You can see it below. There have been several URLs as well. Most probably recall the site being located at toysrgus.com, but the earliest address was http://www.cs.washington.edu/homes/lopez/collectors.html. Finally, here's Gus' original announcement on rec.arts.sf.starwars. Poor Mark Nelson wasn't even sure what the world wide web was. He wasn't alone. Someone had to explain to me what a "browser" was after I tried and failed to access the Archive. One of the toys on sale is the Star Wars Cantina Adventure set, but the figures which Sears chose to show posed next to the toy in question are rather unique. What Sears has done is taken an image of a very early version of the Kenner line and created their own lineart of it. Sears is basing their depiction of the figures on the first conceptual models which Kenner ever created for Star Wars toys. Kenner used Fisher Price Adventure People as a base and did quick kitbashed versions of what the line might look like. We have a better look at these early concepts here: Mock-Up Star Wars Figures. No other images of the Fisher Price Adventure People mock-ups were known to exist, so it's rather amusing that collectors could have opened the newspaper any time in the past 35 years and found new images of them. So, what we have here is a department store advertisement which is using very early conceptual images of the toys. 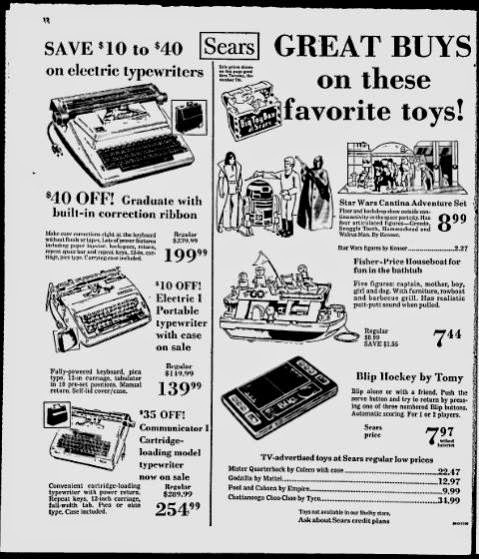 Just how Sears got a Kenner image of an early internal version of the toys is unexplained. Whether Kenner sent it to them for some reason or if Sears got the picture by some other means has not been determined. Your guess is also as good as mine as to why a store would use the image in an ad even if they were able to somehow obtain it, especially since by the time the ad ran, the toys had already been on store shelves for quite some time. Anyone paying the least bit of attention would have seen that the early mock-up figures looked nothing like the finished product, but I guess Sears decided that it didn't really matter. Personally, I'm glad they did. It's just one more reason to love old newspaper ads. 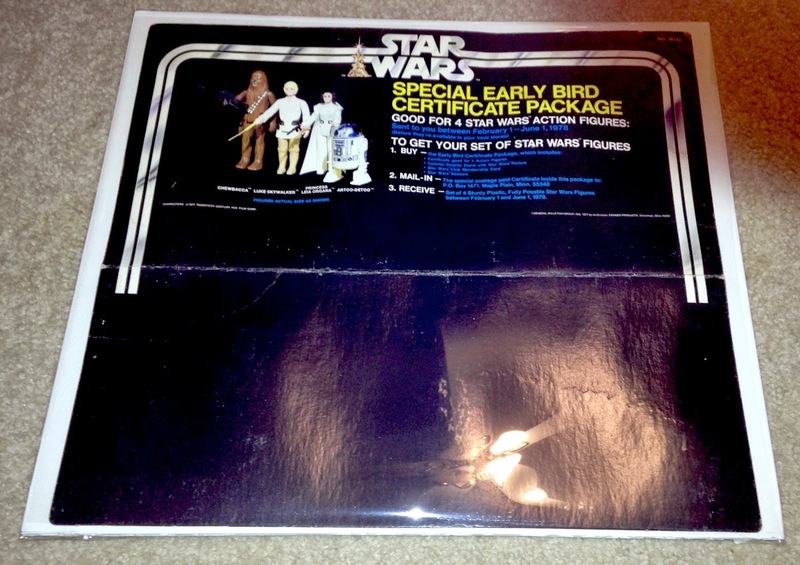 I'm thinking of going into Sears and trying to get a raincheck on a set of Star Wars Adventure People mock-ups. Those would definitely be worth a trip to the store. The MarketWatch correspondents arrive to the blog. A few years back I started up the old MarketWatch blog as a way to contribute to Skye and Steve's 'chivecast. For me it started with Greedo and a few 'Advanced searches' on ebay which I compiled into a list of sales and sent to Steve via PM on Rebelscum. Steve responded that it was a great help and so I did the same the next month. A few months later it had become a tradition of sorts, and I think Skye even termed us as 'interns'. I setup 'chivecastmarketwatch' as a way of recording the research I was doing, and a way of compiling into something a little more permanent than a Rebelscum PM. At the same time Pete was also contributing market data to Steve via email. So we got together and setup 'MarketWatch from the Sandcrawler' - with Pete contributing a monthly overview of the market, while I concentrated on the figure for the month (relative to the podcast). And here we are now part of the official SWCA site, with its new blog style, and a new home for the MarketWatch. It's been an interesting time to have watched the market the past year or two. And that is part of why we created the blog, so you can go back and see how the market has moved. (Here's the November 2012 post for Boba Fett, a little sobering if you're hunting a Boba Fett piece). So going forward you'll hear from me with the 'Figure of the Month", which corresponds to the figure spotlight on the 'chivecast. Pete prepares a general MarketWatch update, covering items such as sealed items, loose and opened items, the rare and super-expensive and any other item(s) that provide a good talking point for the update. If you're like me, you have a lot of flat items that need to be protected and displayed. Store displays present a particular challenge. They tend to be unusually shaped and/or sized, and they're easily bent and dinged. Semi-rigid plastic sheaths, sometimes called "toploaders," are out there. The problem is that their lack of rigidity leaves your collectible in jeopardy of being bent. That's the last thing you want. Also, I've never been terribly comfortable with their stability. Are they, in fact, archival? I don't think I've ever gotten a firm answer to that question. My favored method of protecting such items involves affixing them to foam core using rolled Mylar. This technique provides rigidity while 1) leaving your collectible looking sharp and 2) preserving it in a manner that's reasonably archival. If you're not familiar with archival Mylar, it's a type of polyester film that's both crystal clear and very stable. Museums often use it to help preserve valuable old documents. A good source of rolled Mylar is Bags Unlimited, a company in Rochester, New York that caters to the storage and preservation needs of collectors. You can purchase a roll of Mylar here. I recommend the 3 mil variety, as it has some toughness while remaining fairly easy to fold. The foam core can also be purchased through Bags Unlimited. But if you need large sizes, you might have to forgo the acid-free option and get regular old foam core instead. Alternatively, your local craft store might be able to sell you acid-free foam core through their framing division. It's expensive, but that's the safest option. However, I think you'll be fine with normal foam core, provided you cover the front side of it with Mylar before laying your collectible down on it. That way, no part of your precious will be touching the foam core. It'll be happily floating between two layers of Mylar. Cut the foam core so that it's slightly larger than the item you're encapsulating. Cut a piece Mylar to a size that's a hair's breadth under the size of the foam backer board. Lay that Mylar over the foam core. Lay your flat collectible on top of the Mylar + foam core. Cut a piece of Mylar that's about an inch to an inch and a half larger than the foam core. Place the newly cut piece of Mylar over the whole thing, then flip over. When done, you'll have a collectible that's safe to display. This method works great for shelf-talkers and box flats as well as posters and store displays. You can even affix a hanger to the back and stick it on a wall. Below you'll find some examples of displays I've encapsulated in this manner. Skye goes solo on the eve of the Archive's 20th anniversary after a weird episode from the night before is "lost" to the digital abyss. The new facets of the Archive and blog are highlighted, along with some news for a celebration of some sort happening in Anaheim next year. From there, you'll hear from a number of collectors from the Carolinas discussing favorite items from their collections and a road trip story that harkens back to the straight-out-of-a-exploitation-horror-film vibe of one of the podcast's earliest stories. All that and a taste of things to come on this first installment of our 2014 "Summer Special" double issue. The show (and the enhanced version) is also available through iTunes. Today (August 20, 2014) is the 20th anniversary of the Star Wars Collectors Archive, the first Star Wars collecting website on the Internet. When I started "The Archive" with friends 20 years ago, we wanted to build a destination where fellow collectors could share information as we were all ramping up and learning a lot about this hobby. 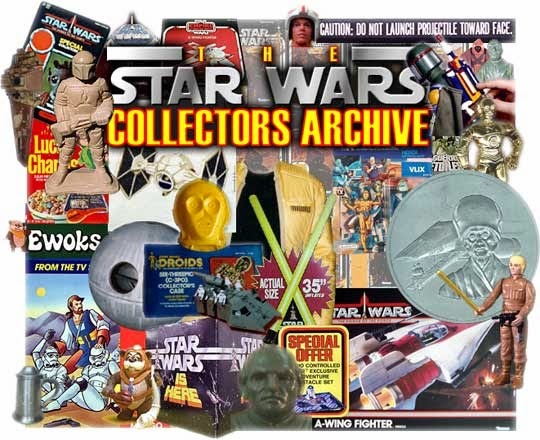 At the time, people thought I was nuts to build a website devoted to such an esoteric topic as "Star Wars collecting." It was years before this hobby went mainstream, and the idea of a site dedicated to Star Wars collecting seemed too narrow for anyone to notice. Today, there are many wonderful Star Wars collecting websites covering various aspects of the hobby. In 1994, most of us were students or recent grads, building our collections on shoestring budgets and learning and documenting everything we discovered. None of us owned prototypes or anything obscure, but we craved and assembled as much information as we could find about previously unknown Star Wars collectibles. We had a lot to learn and explore. Many of us had never met in person, and only knew each other through online connections. Years later, all of us traveled around the world to conventions and get-togethers to share our passion for the hobby and meet thousands of other fellow collectors. Little did we know that the Internet would play a profound role in shaping Star Wars collecting. 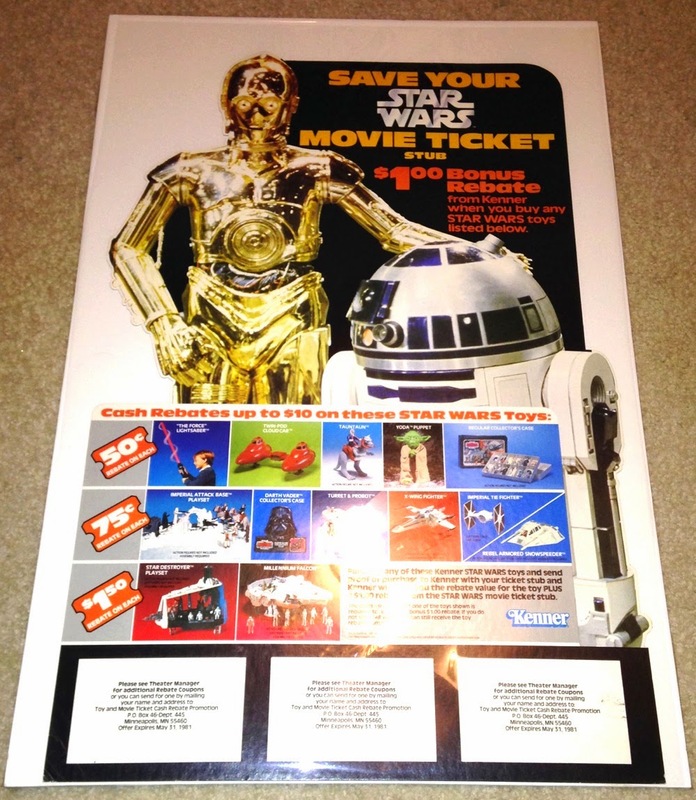 The generation that grew up with Star Wars as kids were among the first adopters of Internet technology when it went mainstream in the 1990's, connected like-minded collectors all over the world. This allowed collectors to assemble and validate information from a wide range of experts and sources in a way that had never been possible. 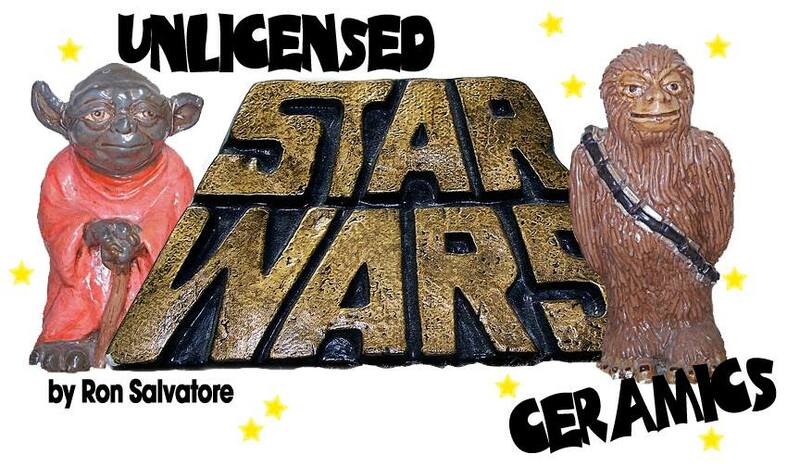 It also opened up a global marketplace for Star Wars collectibles. Along the way The Archive was the place for many firsts we were proud to introduce to the hobby. In addition to being the first Star Wars collecting website, we unearthed previously unknown Kenner toy concepts many times over and likely played a small part in collectors' awareness and interest in toy prototypes. We were the first to publicly showcase images of some of the greatest collections from people like Steve Denny, Tom Neiheisel, Steve Sansweet, John Kellerman, and Bill Plumb, to name a few. We published the first guide to Power of the Force coins and a coin rarity scale that is still widely in use today. 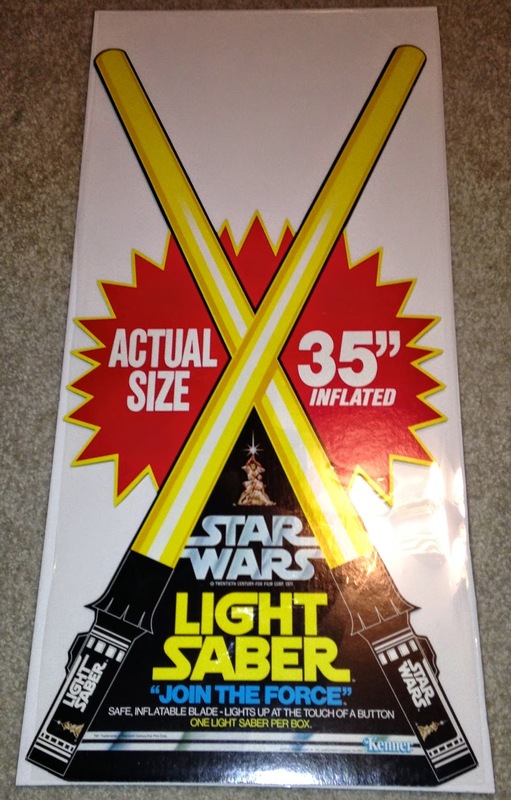 We were the first to share information on and photos of bootleg Star Wars toys. We built the first and still the largest searchable/browsable database of all Star Wars items known to exist. We launched the first website for custom action figures--an Archive section that has long since been retired as it is now so well served by many other sites. We published extensive information on available items and rarities in areas like store displays, the Micro Collection, coins, cast & crew items, Tri-Logo figures, posters, and even 8-tracks. At times we stepped beyond collecting and were the first to share information about visiting the Star Wars filming locations. We were even the first website to publish images of the long-awaited POTF2 figures in 1995 (a habit that we quickly got sick of and proudly dropped by wave 2). The Archive was never designed to be a mainstream/corporate Star Wars collecting website. No one makes money off the Archive. We're grateful to our single sponsor (Brian's Toys) who pays exactly our server costs and no more. We regularly turn down offers from other interested sponsors and advertisers because we believe in building a site that is by collectors for collectors. We aren't interested in keeping everyone updated on the latest items on store shelves (that is well served by many other sites). 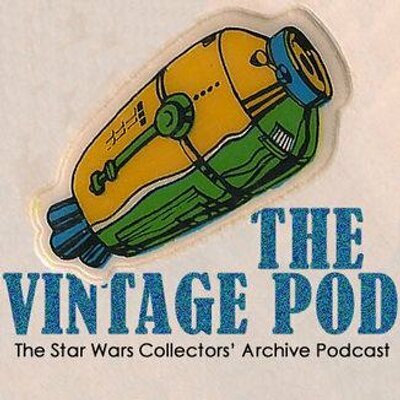 But we regularly hear from other collectors that The Archive has taught them a lot about the hobby, played a big part in inspiring their interests, and that they enjoy going through our virtual museum of Star Wars collectibles. No one can predict what the next 20 years of the Archive will bring. But with the 20th anniversary we are taking The Archive in new directions. First, we're doing a major website redesign to make information easier and convenient to find. Next, we are launching a set of blogs by the existing Archive staff and some new friends to help us cover a wider range of topics. We are highlighting the SWCA Podcast and MarketWatch with top level integration into the site. We are going to present more frequent collecting topics on the Archive home page. Finally, I want to express huge thanks to all of the Archive editors and the hundreds of collectors who have contributed content to the Archive over the past two decades. Star Wars collecting is vast, and no single collector can cover everything in this hobby, but the community can create something really awesome. The Archive has changed a lot over the years but one constant has remained--the Star Wars collecting community made this all possible. The 'Chive Cast settles into its (semi)new home on the SWCA Blog with an on-the-fly recording. One of the ongoing features of the blog will be "digests" of newly added entries to the Archive. In the future, direct links to the entries will also appear on the main SWCA rotator. This introductory post highlights the most recent additions to the Archive from the month of May, 2014. Collectors have been speculating about a vintage Grand Moff Tarkin action figure for years, but evidence that the character was even considered for release as an action figure has always been scant. Aside from this late, post-POTF item, there hasn't been any indication that Kenner seriously considered or worked on a Tarkin toy -- until now. This list of proposed products from 1977 surfaced with a host of other pieces of Kenner paperwork in a find you can read about here. It references a few Star Wars items that were actually made, like the X-Wing Pilot figure (later marketed as a Luke Skywalker toy), Droid Factory playset, and the rather obscure double van set. However, several of the referenced toys never saw the light of day. As the above "product list" demonstrates, people who love piecing together Star Wars toy history love internal Kenner paperwork. 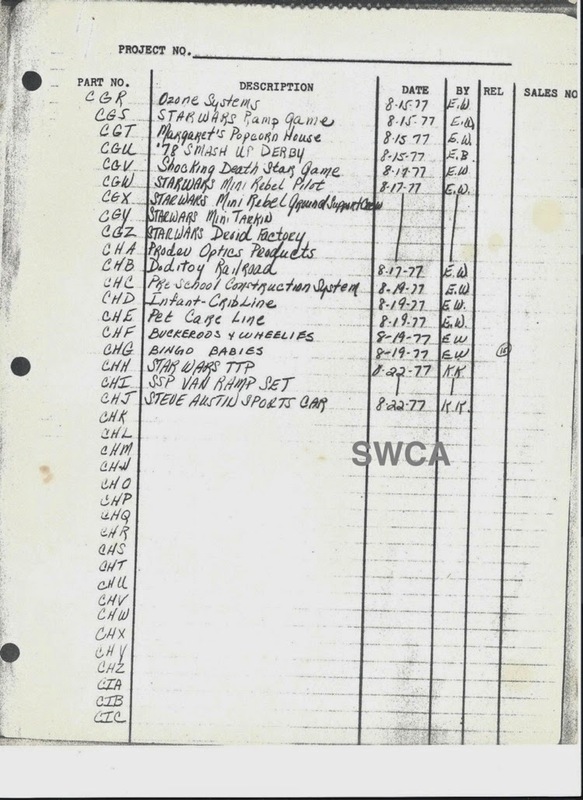 Sometimes a single piece of paperwork can shed light on a mystery that collectors have been trying to solve for years. Here are a couple of gems from the collection of Ross Cuddie. 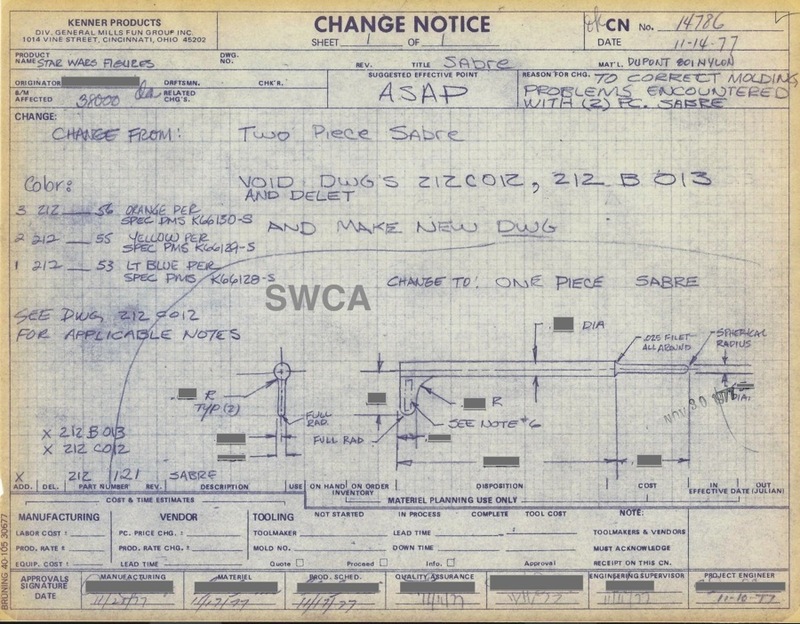 This "change notice" relates to one of the most familiar of Star Wars action figure accessories, the non-telescoping version of the slide-out lightsaber, which came packaged with Darth Vader, Ben Kenobi, and the original version of Luke Skywalker. It reveals that the original "double-telescoping" version of the part was ditched and replaced with a simpler one-piece model due to "molding problems" encountered during mass production.Be sure to check out the full entry for a great story from Ross. 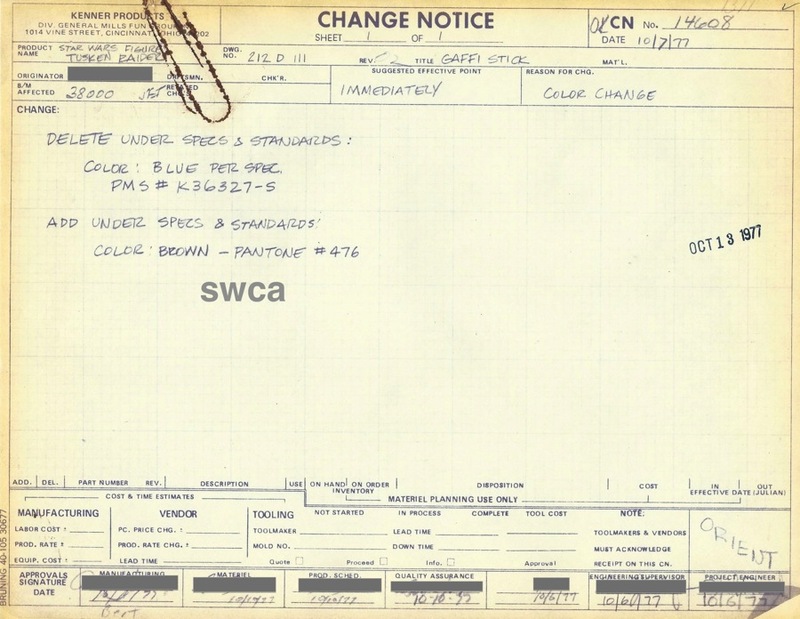 This piece of paperwork related to the Tusken Raider action figure reflects a pre-production change to the color of the "gaffi stick" accessory with which the toy came packaged. Specifically, it reveals that the accessory was initially planned to be injection-molded in blue plastic, quite likely similar to similar to the steely, dark-toned blue that was used for the guns of many Empire Strikes Back-era action figures. Does Salacious Crumb count as an action figure? Debatable, though there are some collectors that argue that he's definitely a part of the standard figure line. Gone are the days when the Crumbs and the Dianogas of the world were relegated to the back of the action figure carrying case, treated like second-class citizens by the whole of the articulated majority. Figure or not, it's pretty hard to imagine the vintage line without a Crumb of some kind. And since the hunk of unarticulated, yellowish PVC that Kenner gave us back in 1983 is all we got, it seems that we have to be appreciate the little guy, even if there isn't much "action" to be found in him. 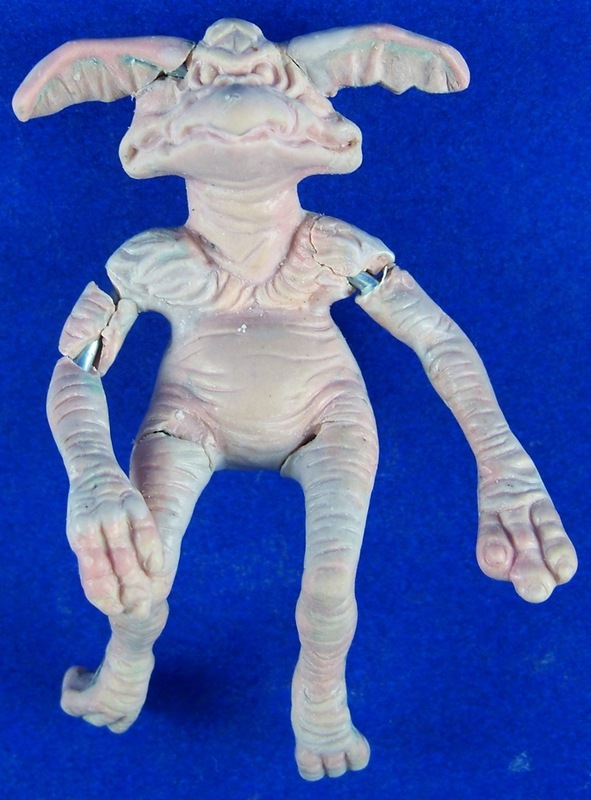 Anyway, what you see here is the original wax sculpt for the Salacious Crumb non-action figure. It's the master used to produce every one of the bagged examples you can still find on eBay at bargain prices. Check out the entry for photos of some related Crumb-y items. 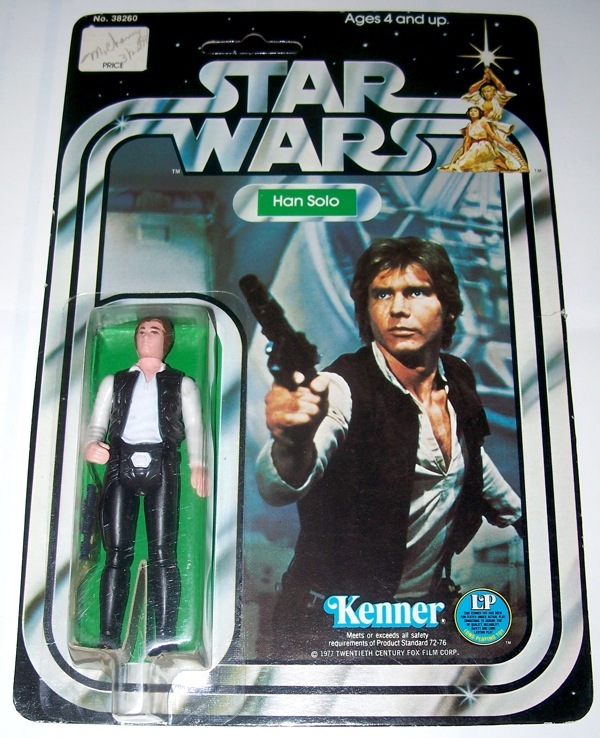 Seen here is what must be one of the earliest production samples of the carded Han Solo action figure. 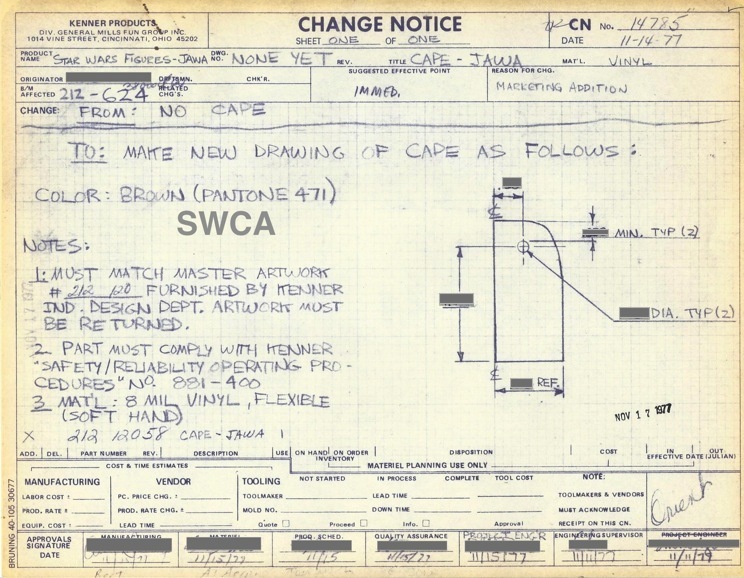 It's identical to a regular Han 12-back A (the debut version of the Star Wars cardback), except for the presence of a sign-off notation in the white pricing area. The date is March of 1978. There are a number of legitimate QC samples floating around out there. However, collectors need to be very wary of fakes, as it's beyond easy for someone to write on a carded figure and then try to pass it off as something special. This one was purchased directly from a former Kenner employee, so there are no doubts as to its authenticity.